At its height the Roman Empire extended into three continents. Its borders reflected the waxing and waning of power over more than a millennium. In what is now Germany there were several military campaigns into the area north of the Alps and east of the River Rhine from 55/53 BC to 15-16 AD, but the area was not brought under direct control until around 85 AD when the oldest part of the Limes was created between the River Rhine and the high Taunus Mountains. This frontier followed the contours of the landscape. Later the courses defined were much straighter and the first forts established. Similarly, in the area of the Raetian Limes the border was secured first under Emperor Claudius (41-54 AD), probably moved north across the river under Emperor Domitian, and then under Emperor Trajan forts were established. The early Limes barrier seems to have been a cleared stretch of forest monitored by wooden towers. Under Emperor Hadrian (117-138 AD) the Limes was additionally secured with a palisade fence. In the 2nd century AD the Limes was in part straightened, and also strengthened with embankments or stone walls and numerous forts, and fortlets. The nomination acknowledges that the chronology of the creation and expansion of the Limes is under-researched and more work needs to be done to establish firm dates and sequences. The Upper German-Raetian Limes was given up during the second half of the 3rd century AD, probably about 260AD. After the end of Roman rule, many Romanised Celtic- German peoples moved away from territory within the Limes and other new Germanic settlers moved in. Although the walls survived for many centuries as an impressive landmark, gradually facts about its rationale and use were replaced by myths and legends. This is a serial site with locations in both Germany and in the United Kingdom. The UK portions of the site, Hadrian’s Wall and Antonine’s Wall, are better know. The walls still exist today in a form which tells you what they were. The Germany portion of the site is longer but less well known. I visited the Saalburg Roman Castle and Archeology Park which is just outside the city of Bad Homburg, north of Frankfurt. The fort is a reconstruction from the 19th century based on the foundations of the Roman buildings which originally stood there. It houses a museum of Roman artifacts found in the area as well as being near one of the limes (not pronounced like the citrus fruit. It comes from the Latin root of the word for ‘limit’). The limes extend up the Rhine river for several hundred kilometers. Unlike the walls in the UK, however, they aren’t as dramatic or obvious. The only thing which exists is most places are some earthen mounds that you might not even notice if you don’t know what you are looking at. 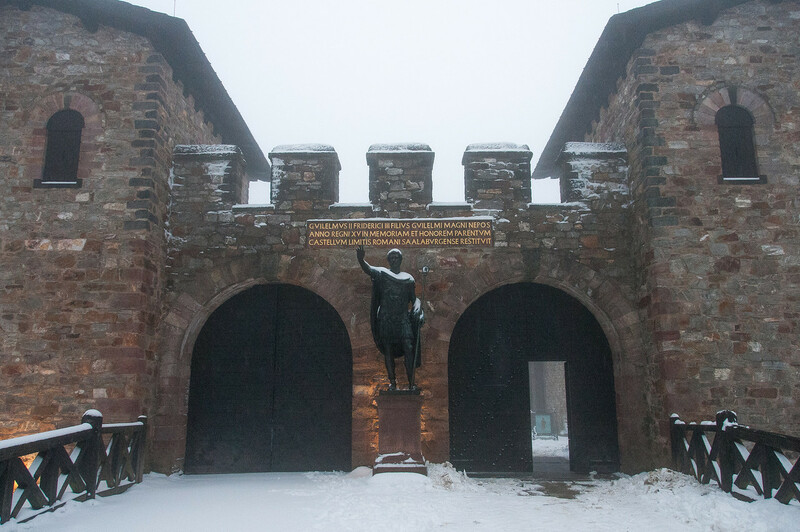 From all the research I’ve done, the Saalburg fort is probably the best place to experience the limes in Germany in terms of a museum and interpretative center, however, they can be found in many locations. There is also a trail which follows the route of the limes. I plan to visit the walls in the UK and when I do I will update this post accordingly. The Frontiers of the Roman Empire is a cultural UNESCO World Heritage Site known as one of the most impressive and longest archeological monuments in Europe. 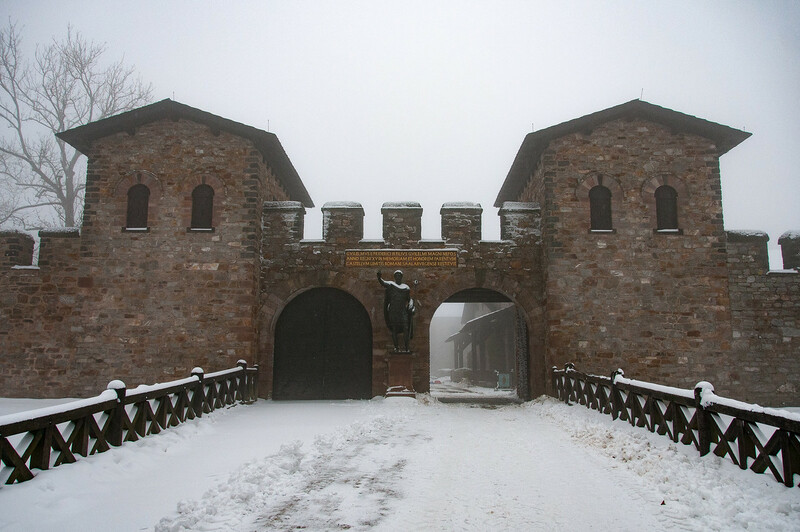 This UNESCO property consists of a boundary built by the Roman Empire from the Rhine to the Danube River. This monument spans 550 kilometers in total distance. The Frontiers of the Roman Empire was built 2,000 years ago. It consists of watchtowers, forts, palisades, and defensive walls. These structures helped to protect the Roman Empire from the Barbarians. The Limes is the most significant feature of the Frontiers of the Roman Empire UNESCO site. In addition, the original Roman ruins and their reconstructions are still intact to this day. There are more architectural digs and replicas that were amassed over the years by archaeologists who have worked hard on gathering evidence of the Roman Empire’s reach in this part of Germany. 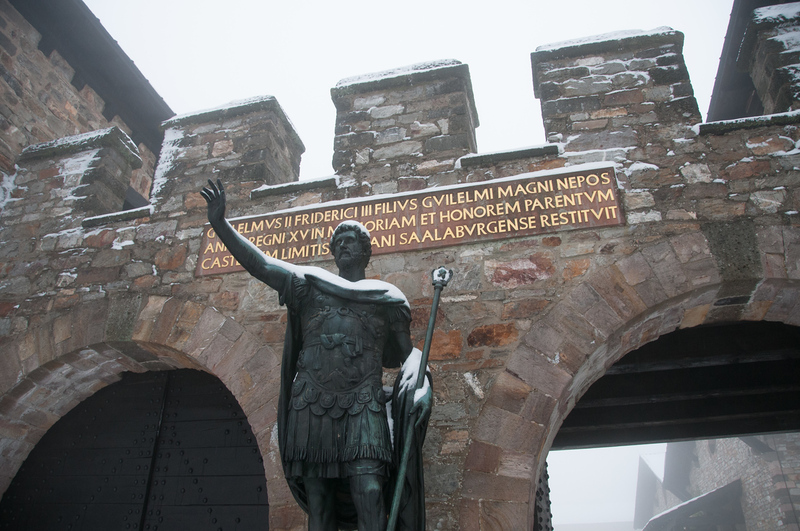 The Roman fort in Saalburg, Germany is one of the highlights to the Frontiers of the Roman Empire. There is also a Roman museum in Osterburken that showcases emblems and exhibits the history of what the Roman civilization brought into this part of Germany. Aside from the Limes, the other component for this UNESCO site is the Hadrian’s Wall. This wall was built upon the order of Roman Emperor Hadrian in 122 AD. The wall took 6 years to build. The soldiers were the ones who worked on building this wall, which runs for up to 117 kilometers long. It is located along the border of England and Scotland. The reasoning behind the Emperor’s decision to have this wall built was to separate the Romans from the Barbarians. Eventually, the wall was expanded to include the Antonine Wall. Aside from the Roman fort in Saalburg and the Roman museum, there were a few other components to the Frontiers of the Roman Empire in Germany. This includes the Roman baths and museum in Weissenburg and the Limes museum and archaeological park in Aalen.